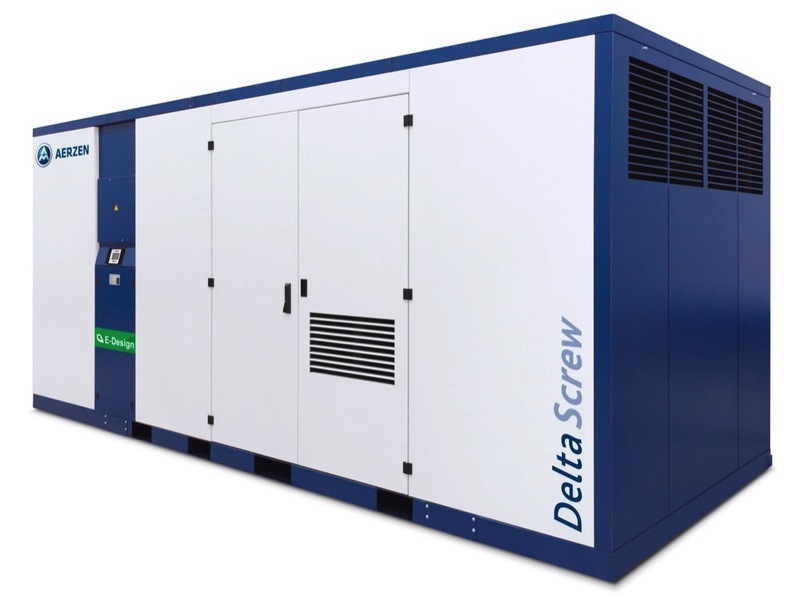 Aerzen, Germany – The successful screw compressor generation Delta Screw from AERZEN gets an addition: With the VM 100 compressor package, the versatile E-Compressor series now comprises seven model variants. Its distinguishing features: the efficient technology for use in the upper volume flow range and the integrated electric acoustic hood fan. The new development of Aerzener Maschinenfabrik will be presented for the first time at COMVAC 2019, the leading international trade fair for compressed air and vacuum technology in Hanover. The new compressor type is designed for a volume flow range from 1500 to 7620 m3/h and covers a maximum differential pressure of 3.5 bar. The application specialist AERZEN is thus responding to specific practical requirements in the low-pressure range and the constantly growing demands for high-performance and efficient technology. All in all, the broad product range of E compressors includes 7 sizes in the volume flow range from 330 to 7620 m³/h and drive capacities from 30 to 630 kW. A special feature of the new model type is the already integrated acoustic hood fan. Another new feature is the space-saving horizontal position of the discharge silencer. Like all E-Compressors of the series, the VM 100 has an acoustic hood with internal supply and exhaust air louvers, which favours the compact design. Flow-optimised intake channels minimise pressure loss significantly. A significant improvement in performance can be achieved by supplying cool outside air directly into the intake filter. Unique is the absolutely oil- and absorbent free compressed air technology of AERZEN. Oil-free operation is certified according to ISO 8573-1/Class 0.The patented principle of the built-in reflection silencer protects against contamination and ensures process reliability over the entire service life of the system. And the latest addition to the E-Class also impresses with its flexibility. Various equipment options and a comprehensive range of accessories complete the VM 100’s operational capability. According to the manufacturer, all Class E screw compressors score points with a strong energy balance. The technology leader from Aerzen calls the sophisticated concept of performance optimisation and resource utilisation, profitability and flexibility “efficiency plus”. With a saving of up to 6% in energy costs over an operating period of 10 years, the investment volume is almost covered. Visit Aerzener Maschinenfabrik at POWTECH 2019 in Nuremberg, Germany, 9.4. – 11.4.2019, Hall 4, Stand 271.